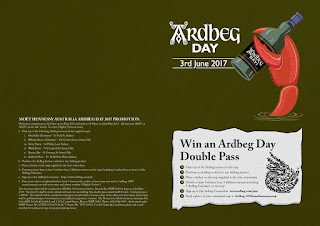 Ardbeg Day 2017 is coming and if you want to get to the yearly Ardbegian party here is a few rules you need to follow. When is Ardbeg Day? Saturday 3rd June 2017. Origins of the Ardbeg Open day come from Feis Ile, Islay Festival of Malt and Music. With each of the classic Islay distilleries open for one day during the festival, Ardbeg has traditionally been allocated the last day of the festival which also became know as Ardbeg Day. 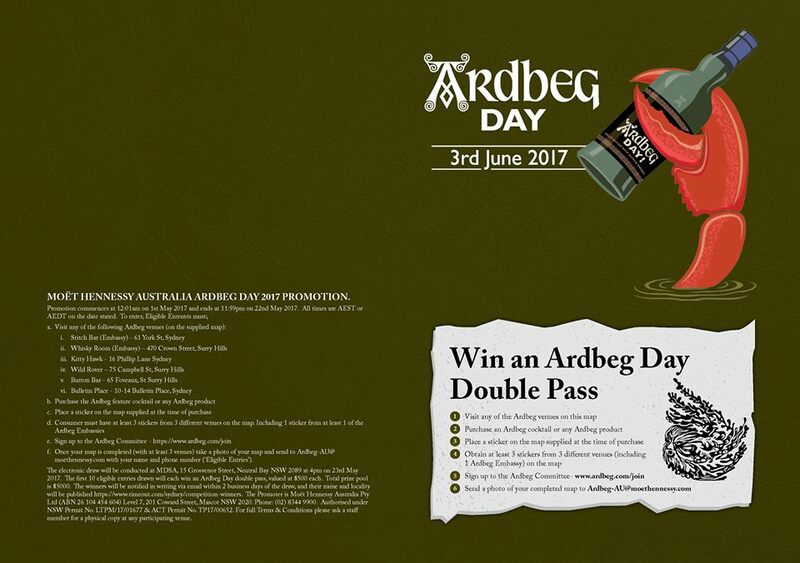 Ardbeg Day has now become an epic world encompassing event celebrated simultaneously in major cities around the world with Sydney included. To be part of Ardbeg Day you not only have to be a Ardbeg lover but also a registered Ardbegian. Those that have attended Ardbeg Day in the past know just how exciting this can be. Whisky flows, cocktails float, contest are won & lost and loot is abound. Most importantly though a sense comradeship is electric as all attendees have something in common. Ardbeg! What goes with Ardbeg Day is the official committee release of the yearly Ardbeg dram. This year it is titled Kelpie. No not the red Australian dog. Kelpie as in seaweed or more so sea monster. The rules for attending change from every year so don’t think what applied last year gets you automatic entry for the event to come. So what are the rules? Well it is certainly more a treasure hunt this year but then you do have to Catch A Kelpie. Much like last year there is draw for names in attendance but first you need to get a series of stamps first. 1. Make sure you are an Ardbeg Committee member. If not get to the Ardbeg website and register now. 2. Head into any of the following Ardbeg venues between May 1st – 22nd 2017, and purchase the Ardbeg Feature cocktail. 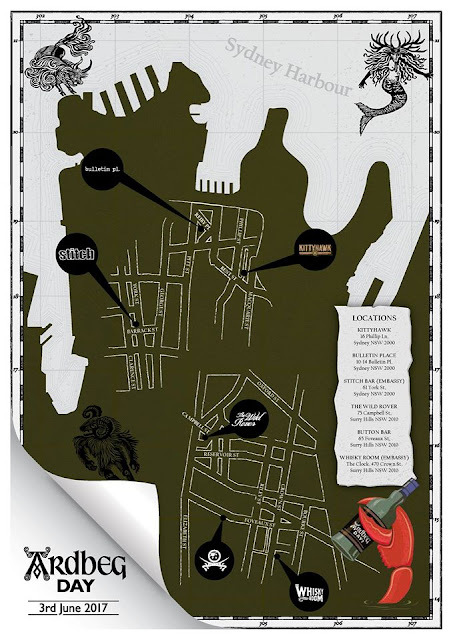 Participating venues are: Stitch Bar; Whisky Room; Kitty Hawk; Wild Rover; Button Bar and Bulletin Place. 3. Upon arrival at your first venue ask the bar for the Ardbeg Treasure Map (see below). 4. When you purchase the Ardbeg Cocktail you will receive an Ardbeg sticker to place on your map. You must obtain 3 different stickers from 3 different Ardbeg venues. From that moment you will be in the draw for yourself and a friend to attend the event on Saturday 3rd June.